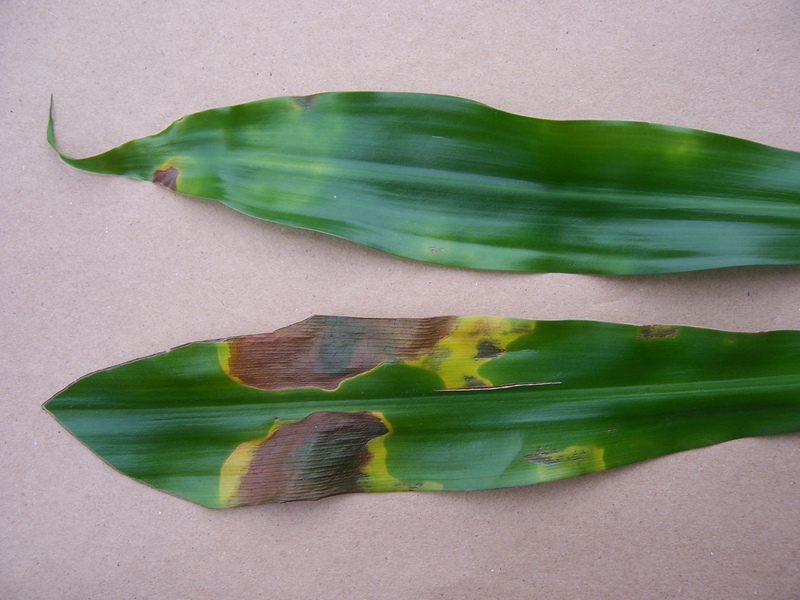 Leaf spots due to fluorine toxicity. Fluorine (F) occurs in the atmosphere as gaseous molecules (F2) and in reduced form as particulate fluoride (F-). In water, inorganic fluorides usually remain in solution (as fluoride ions) under conditions of relatively low pH and hardness. Plants are exposed to fluoride through the air, soil, and water. Natural sources include weathering of fluoride minerals (such as cryolite, feldspar, mica, and apatitite), volcanic gases, and marine aerosols. Aluminum smelting, brick, glass and ceramic manufacturing, and high phosphate fertilizers can also be important sources. Many municipal water sources inject fluorine (at 1 ppm) as an additive to prevent tooth decay. Use of this water for irrigation can result in toxicity symptoms on sensitive plants. In general, soil fluoride is not available to plants. Roots take up small amounts of soil fluoride by diffusion, which results in a low background concentration in the plant foliage. There are exceptions such as tea plants that are natural accumulators of fluoride. Gaseous uptake of fluoride by leaves is rapid due to its high solubility. Fluoride is an accumulative poison in plant foliage. Accumulation may be gradual over time. Fluoride strongly inhibits photosynthesis and other processes. It will move in the transpiration stream from roots or through stomata and accumulate in leaf margins. Typical fluorine injury symptoms on broadleaf plants include marginal and tip necrosis that spread inward. Conifer needles exhibit tip necrosis that spreads to the base. Drought stress or salt toxicity can have similar symptoms. A wide variety of plants are sensitive to fluoride toxicity (Table 1). Typical indoor foliage plants include Dracaena, Tahitian Bridal Veil (Gibasis pellucida), and the spider plant (Chlorophytum comosum). Both Dracaena deremensis and D. fragrans (corn plant) are very sensitive to fluoride toxicity. Fruits such as apricot, blueberry, grape, peach, and plums are also sensitive. Conifers that are sensitive include Douglas-fir, western larch, most pines, and blue spruce. Sensitive flowering plants include gladiolus, lily, tulip, and yucca. Domestic water that contains chlorine and/or fluoride is usually not harmful to poinsettias. Avoiding fluorine toxicity starts with knowing which plants are sensitive. Avoid fluoridated water, high phosphate fertilizers, and low soil pH. An exception would be low pH-loving plants like blueberry. High calcium levels in the soil or rooting medium, such as use of dolomite, can help tie up fluoride and prevent injury. * Plant are considered sensitive when injury has been observed on most of the species and when leaf analysis revealed a fluoride content less than 50 ppm. Some cultivars are intermediate insensitivity. Soft suture or red suture disease of the fruit. Krupa, S. 2001. Fluorine. In Maloy, O. C. and Murray, T.D. 2001. Encyclopedia of plant pathology. p465.